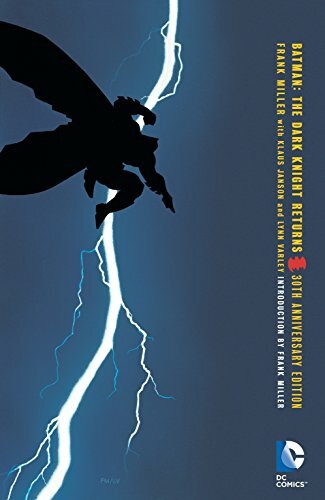 Amazon.com description: Product Description: Writer/artist Frank Miller completely reinvents the legend of Batman in this saga of a near-future Gotham City gone to rot, 10 years after the Dark Knightâs retirement. Forced to take action, the Dark Knight returns in a blaze of fury, taking on a whole new generation of criminals and matching their level of violence. He is soon joined by a new Robinâa girl named Carrie Kelley, who proves to be just as invaluable as her predecessors. Can Batman and Robin deal with the threat posed by their deadliest enemies, after years of incarceration have turned them into perfect psychopaths? And more important, can anyone survive the coming fallout from an undeclared war between the superpowersâor the clash of what were once the worldâs greatest heroes? Hailed as a comics masterpiece, THE DARK KNIGHT RETURNS is Frank Millerâs (300 and Sin City) reinvention of Gothamâs legendary protector. It remains one of the most influential stories ever told in comics, with its echoes felt in all media forms of DCâs storytelling. Collects issues #1-4.